Backpacks. Messenger bags. Holster bags. 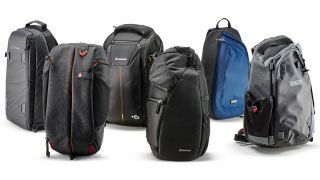 You’re spoilt for choice when it comes to ways to picking the best camera bag to carry your gear. But it’s easy to forget there is another way: the camera sling bag. Shaped like a camera backpack and worn in the same position, slings are distinguished by having just a single shoulder strap that’s worn diagonally across your body, like a car seatbelt. This enables you to easily swing the bag to your front in a single move, with its side opening facing up at you. You can then access your gear without having to put the bag down. Accessibility is almost as easy as with a shoulder bag, but despite both being suspended by a single strap, the camera sling bag’s rearward resting place makes it more comfortable on longer excursions. There’s still only so much weight you’ll want to shoulder on one shoulder though, so most sling bags for cameras are designed to carry just your camera, two or three choice lenses, and essential accessories. This streamlined storage does at least make a sling bag great for slipping through crowded city streets, and you should have no trouble meeting even the strictest airline carry-on size limits. So what's the best camera sling bag? Right now, we think it's the Solstice Sling 10 by Tenba: it's a simple yet very effective sling that's spacious, comfy and well made, and therefore very hard to beat. Vanguard's Alta Rise 43 Sling is also a great choice if you need something bigger, while the Manfrotto Pro Light FastTrack-8 2-in-1 could be for you if you've got a smaller camera. Whichever sling bag you choose, you can be assured of streamlined yet versatile storage that's great on the go. Despite boasting a fairly small 10L capacity, and measuring a relatively narrow 24cm, the boxy shape of the Solstice makes it a practical size. It’s well suited to carrying a full-frame body with two or three lenses, and they’ll be well protected. Generous front, rear and base padding, along with substantial interior dividers, give the Solstice a tough feel, as do the quality water-resistant outer materials. Access is via a full length side flap that gives a wide opening to the whole bag. On the opposite side is an expanding pouch suitable for a bottle, or a typical travel tripod, anchored by an additional side strap. Up front is a long slot opening revealing storage for a tablet and filters. Speaking of anchoring, this camera sling bag also features a secondary cross-body strap for keeping things stable when you’re really on the move. The main strap sits on your left shoulder. It’s supple and well padded, and combined with the decent back padding makes the Solstice a comfortable companion. With an exterior measuring 265 x 450 x 200mm, this is the bulkiest camera sling bag here. Much of this is due to the superb level of front and rear padding though. Your gear will be cossetted by thick interior dividers, coloured yellow so contents stand out. There’s the usual side access, but the bag also features an opening top/front panel, so your contents can be fully revealed as if they were in a typical backpack. The top compartment is an open space large and square-ish enough to be fairly versatile. Should you need even more capacity, the front panel is expandable, allowing you to carry longer lenses in a front-back orientation. It also contains multiple smaller accessory slots and pouches, while a tripod can be attached externally to tough mounting points on one side. Comfort-wise, the right-mounted shoulder strap isn’t the widest, but is very thickly padded and supplemented by small waist strap. Outer materials are just as uncompromising, making the Alta Rise 43 Sling incredible value. Manfrotto’s sling bag offers some fresh thinking. Mounted on its main shoulder strap is a secondary, smaller strap that functions like a standalone camera sling strap, letting you smoothly slide your camera from its resting position by your hip up to shooting height. When you need to slip your camera away, slide the bag under your shoulder as normal and there’s a pocket at the base that’ll swallow your camera with it still attached to the strap. Two zips then close the compartment and the zippers even attach to each other to keep the pocket closed. You get a conventional side opening which reveals a dedicated lens compartment, but accessory storage is limited to a tablet slot and a couple of stretchy side pouches. The only major drawback is this small sling is sized for mirrorless gear only, though entry-level APS-C DSLRs will just about fit. Camera sling bags are designed for active photography, so it makes sense that the PhotoCross 13 is finished in a durable, water-resistant material that beads rain away very effectively. High quality rain-resistant zips and a durable base add extra protection, so much so that the included raincover seems almost unnecessary. The overall shape is relatively wide, making it versatile enough to carry an ungripped DSLR and lenses including a 70-200mm f/2.8, along with a compact 13” ultrabook. There are even mounting points on the front and included straps to attach a travel tripod. It’s just a pity the internal dividers are rather floppy, making the bag feel squashy and less substantial than some. With the ability to carry so much kit, it’s surprising the shoulder strap is only lightly padded, but it is very wide, well ventilated and surprisingly comfy. There’s also a waist strap that provides extra support and stability, and the back padding is dense enough to insulate you from feeling the bag’s contents. The TurnStyle V2.0 is available in three sizes, the 20 being the largest. Its main compartment is sized for full-frame gear, though a taller DSLR such as a 5D IV is a bit of a squeeze. Up front you get a versatile pocket for storing accessories like a flashgun or filters. Externally the TurnStyle feels very durable, with tightly-woven nylon materials that easily cope in wet weather. This is also a comfy camera sling bag on long shoots thanks to its wide, well padded strap. Though this sits on your left shoulder, like many sling designs, the top is actually attached to the centre of the bag, making it feel more stable. If you need extra support, there’s a basic waist strap, too. Downsides? The internal dividers are thin and too flexible, compromising the bag’s overall rigidity. The main compartment opening is more of a slot than a flap and doesn’t afford the most unobstructed access. Finally, there are no side pouches or mounting points to carry a bottle or tripod. Here’s a camera sling bag that shouldn’t break the bank, or your back, as it weighs in at a featherweight 482g. This is in part due to the bag’s fairly small size, but there’s enough depth to house an ungripped full-frame DSLR with attached 24-70mm, plus another mid sized lens and a flashgun alongside. The top portion of the bag is separated by a removable divider and is intended as a space for storing smaller accessories or personal effects, but the tapering front panel does restrict this area’s practicality. You can’t have it all at such a low price, and the Jazz’s outer materials feel scratchy and less finessed than more expensive rival bags. The shoulder strap is also basic and lacks some flexibility, but is quite well padded, as is the back panel. Inside this is a small compartment large enough for an 8” tablet, plus there’s a mesh pouch on the side that could house a bottle, or at a push, a very compact tripod. Most of the slings in this round-up are capable of carrying a full-frame DSLR body and at least two small lenses. Many bags can also be had in smaller sizes designed for mirrorless kit. Though a camera sling bag is meant to carry just the essentials, most have room for a tablet, or possibly a small laptop. Some also have mounting points for a tripod, and even a compact drone. Easy-access camera sling bags are well suited to life off the beaten track, but if you’re out in all weathers, ensure your chosen bag is weatherproof and has a separate rain cover. Some sling straps rest on your right shoulder, and some the left. This dictates which way you swing your sling to get access, and one direction may feel more natural than the other. With only a single strap, a sling bag can feel less secure on your back than a normal backpack. An additional waist or stabilising strap will keep everything securely anchored.